Having a dog in the house is reassuring. At night, I can hear her toenails click-clacking against the hard wood floor as she patrols the living room, then the kitchen, then to my room to make sure I’m in my bed where I belong, then back to the living room to look out the window at the cars passing by. Then she settles down to chew on her bone and her blanket. Looking innocent. And I sleep all the way through the night with no interruptions. Between half an hour and two hours in to my night’s rest (wait, I’m not so sure it’s rest…), I hear a few crashes and my door swings open and my pup comes in and barks. I get up, following her to the front room where I see a terrible scene: my favorite black binder, a good book, plastic playing cards, notes from a practical college class, all scattered to the four corners of the room. She chews on the remnants of the binder as I go get something to lure her away from the binder and into her kennel as I clean up the scraps. A few hours later, if I have let her back out, she comes in to my room and barks. Nothing bad has happened, she just wants to play. I glance at my cell phone. 2:30 a.m. Yes. Totally a time when humans play. In my dreams. So I just shake my head and go back to bed, trying to ignore the barks and whines that come because I wouldn’t play with her when she was up and active. Now, a good human time to play with her is when I get home from work. And then we get down to business. We’ve been working with a trainer, and after the first session, the Sheepdog That Isn’t Quite Yet a Sheepdog was sitting and making eye contact and all sorts of good stuff, although she was becoming bored with the repetitiveness of only three or so commands. Thursday night, we were able to remedy that as we worked on lying on a designated rug (say a key word like “settle” and she is to lie down on it until I release her; it will be very helpful at suppertime), pressing a doorbell (she did really well at this trick, learning it within the first three minutes) and touching my hand with her nose (eventually, this skill builds up to, “Keep close to my side as we walk”). The real excitement came around 7:00. Cue the decision to leave my bedroom, where my phone was charging. When I was in another room, I heard a crash, said, “Well, that didn’t sound good,” but didn’t worry too much as most crashes are with books and baskets and hairspray. This crash wasn’t any of that. She had become tangled in the cord of my phone charger, pulled my Nokia 1020 to the ground where the screen glass shattered, said, “Ooh, this looks fun to chew,” clenched it tight in her canine canines and ran. She ran to the room, which is where she always drops her loot to come to the kitchen. She stands in the doorway to see if I noticed anything amiss. I sure had that time. So I went to the front room and saw my phone in her mouth. At first, I wasn’t concerned. She had stolen it before and all had turned out well, no scratches or dents. However, as I drew closer, my eyes grew wide as I started to see cracks in the screen. “Leave it,” I said, trying to convince her to drop it. And drop it, she did. That is, after running a few feet away and losing her grip on it. I cringed as the Nokia hit the floor. Luckily, The Pup came running back to me, tongue lolling, ready for her treat. I threw her one, away from my phone, a treat for dropping it (which, in a way, seems rather unfair, to me) so I could get to it. I picked it up and cringed. 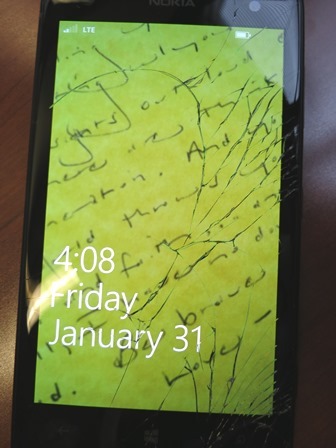 Cracks spiderwebbed up and down and sideways across the screen of my phone. I quickly checked each area of the screen to make sure the touchscreen was still working. It was, a relief. I plugged it back in to the charger, and that fired right up. Another relief. Carefully, I wiped the screen with my finger, slightly wary of tiny pieces of glass becoming wedged in my fingers somehow. Nothing did, that I know of, but just a week or so ago, I had knocked over a flower vase that I had really liked and planned to use along with some colorful beads that inflated when water was added to them. The vase shattered and The Pup had scattered the beads all across the floor the night she practically ate my binder. When cleaning up the vase, I had gotten glass wedged in my palm. I was able to pick it out, but sure as anything didn’t want that to happen again. Then I looked up the cost to replace a screen, and it sure wasn’t pretty…..this was the second Nokia Lumia 1020 I had had, having to return the first under warranty due to a bad battery, which meant that this phone was only two months old. And the warranty doesn’t cover Destruction by Exploring Dog. I put the phone down and thought, well, I’ve still got supper. A large yogurt container held meatballs I had made a couple of weeks ago, so I pulled out the first plate of the pile, a clear glass one, and dumped the sauce-soaked spheres onto it. Blocking the meatballs from being eaten by The Pup, I placed them in the microwave, set the timer to two minutes, then went to the cabinet for some buns. Once again, I had my hands full deterring The Pup. I heard a loud pop from the microwave. Thought it was just the meatballs. It had not been a pop. It had been a crack…the plate beneath the meatballs was no more. It had split cleanly in two pieces, jags as deep as the Grand Canyon. And then, of course, what did I do? Grabbed my phone, which was my camera. And I took pictures. After all, this whole adventure would not have really happened unless I wrote a long story about it, right? 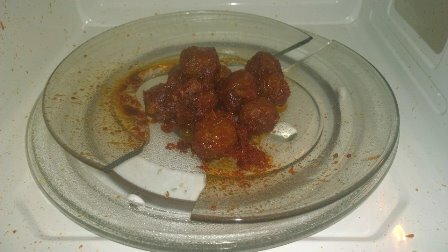 I transferred the meatballs onto another plate, got some bread and determined to waste not. That didn’t work out. Especially after a couple of meatballs crunched. Meatballs are not supposed to crunch. That’s all I’m saying. Losing this supper was especially sad because I liked that batch of meatballs, and I had lost my lunch that morning when The Pup jumped up on the counter to grab the plastic bag that contained my frozen chicken patty. I thought I’d be able to rescue it, so I went after her, but as soon as I did rescue it, I threw my hands in the air too quickly to get the chicken patty away from her. The patty went flying out of the plastic bag, through the air and into the paws of that incredibly tenacious dog. So I had to go with Plan B, cold lunchmeat. What a disappointment it is to eat cold food when one is looking forward to hot food! Anyway, it was just not a good night for glass. Let’s hit the rewind button. All the way up to…well, all the way up to the beginning of this story, really. Erasing everything except the meatballs. All of this would never have happened (except for the exploding plate, that just came from my own stupidity, although in my defense, I’ve used that plate to heat up green beans before; guess meatballs are different…) if I did not have a dog in the house. So, no blog post. I would be well-rested. I would have had a chicken patty for lunch. I would not have as much excitement in my life as I do now. I would not be reminded every day that there is a lot of cool stuff in the world (leaves, trees, dead and stiff garden snakes….). And I would not have a goofy brown-eyed cattle/sheep dog running across my couch or on the banks of a pond in an absolutely amazing way. I love watching her run. So things are good. Throughout writing this post, I had to get up three times to investigate crashes and scratches and barks. 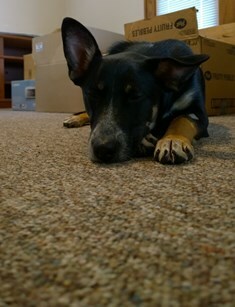 But still….having a dog in the house is definitely worth it.